This product has been specially formulated for swimming pools and very effectively guards them from the harsh rays of the sun. It puts an invisible blanket over the pool all year round protecting chlorine from ultraviolet light. When used regularly LO-CHLOR LIQUID STABILISER will assist in reducing chlorine demand and consumption. Running costs will therefore be reduced. Regular usage also improves filtration and ensures that stabiliser levels remain at the perfect level for 365 days of the year which in turn assists in keeping the pool water in perfect balance for that period. 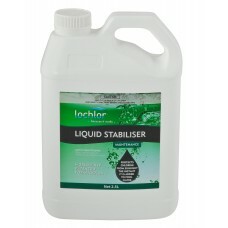 LO-CHLOR LIQUID STABILISER Is fast dissolving and there is no mixing involved. The product is simply poured either directly into the pool or via the skimmer box. It is ideal for all pool finishes. Protects chlorine from the harsh rays of the sun. Protects chlorine from the moment it is added. No messy dilutions or pre-dissolving. It is not an acid - it is a salt. It has a pool friendly pH. Chlorine will last 6 to 10 times longer in pool water. Reduces chlorine demand and consumption. 5 litres increases cya level by 35ppm in 50,000 litre pool. Will not harm any equipment or pool surface. Works efficiently in any water temperature. Ensure perfect stabiliser levels 365 days of the year.